Above: The elusive 87 ATCs, the only proof they exist is this little Ad. 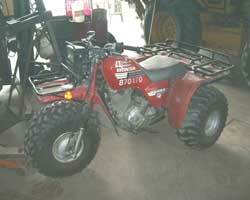 The 87 Honda ATC350X, and 87 Honda ATC250R, Missing from every part of every History book there is. Without this little Brochure here no one would ever have even known they existed. In fact, the Honda line Identification book, which suposedly lists every single Honda motorcycle ever (for the USA) has absolutely no sign of the 87 350X, or 250R. 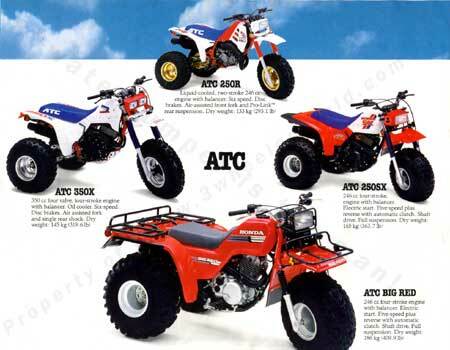 There is however listings for the 87 ATC200X, 87 ATC250ES(Big Red) and 87 ATC250sx. But, why no 350X or 250R? Many believe that since these were the "Highest" performance models, and because of all the bad press surrounding the Consent Decree and the 20/20 video that made threewheelers so unpopular, that Honda pulled these machines from their lineup and they never made it anywheres. Others believe they got shipped back to Honda of America, and then sent off and distributed to other countries. Both are sound theories. It now seems pretty clear that the 250ES's, 250SX's, and 200X's are pretty common...but what about the ATC250R and ATC350X? 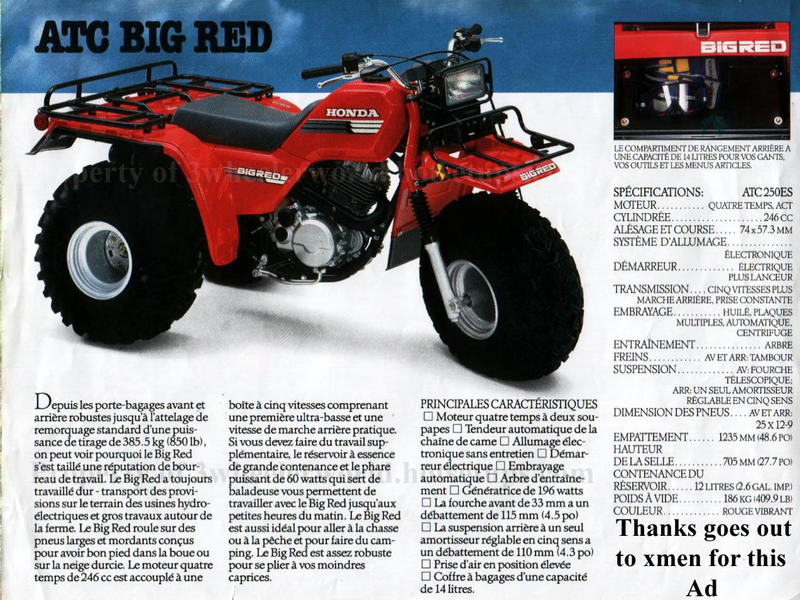 Originally it was thought that Canada was the only home for the 2 High performance 87's, Mainly because the original ad we had was in French, and it came from Quebec. But even though this new Brochure (Above) is in English, it originated from Canada. Many people from Canada, and other countries have searched for these two and no one has ever recovered one. So this arises another question, did Honda recall these machines before they made into the market? Are they what we see being parted out on eBay as "New engines"? It is my personal belief that this is the case. And this email provided by Tim Guin only seems to make it more concrete of a theory in my mind. Board member owns an 87 350x?!?! One of our Canadian members, packhamstruck posted some pictures of his 350x on The Forum along with a picture of the build tag that clearly shows it as an 87. 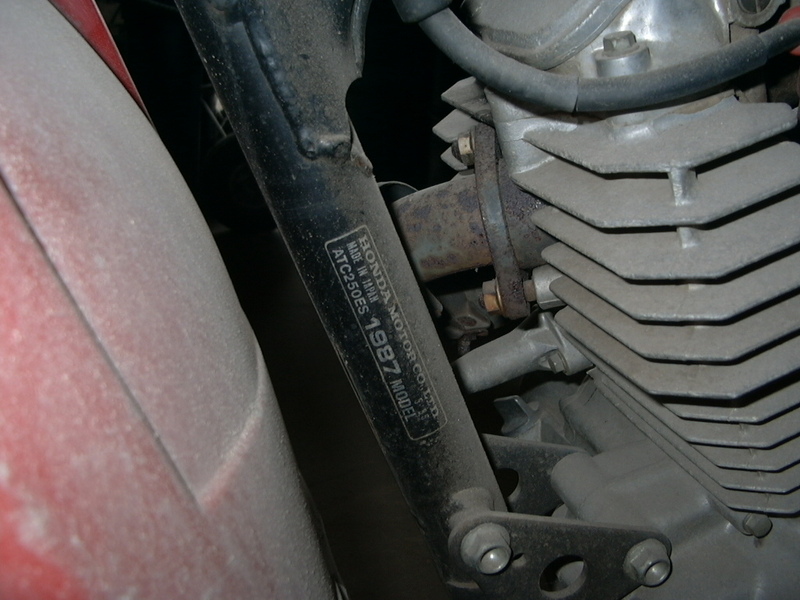 There were also some other differences, like the motor mounts are solid and do not have cut outs like the normal ones. I studied the photo that had the VIN tag on it and came to the conclusion that the # read "JH2MC1203h8000?M7". I then consulted my Hondaline Identification guide, and I did not get any matches. However, this book is put out by Honda of America, so it is possible that because this is a Canadian machine it is not detailed in my book. I have not contacted Honda of Canada yet. A few people have mentioned that the build tag looks a little odd, and others that Honda is not known for printing the vins on the build tags. My only thought on that is perhaps it is different in other countries, or when/if the American models went to other countries, they had to replace the vins with new ones so as to not cause errors and what not within the registration of them. i can shed some light on the 87 350x and 250r subject. my supervisor at work has an actual 87 350x motor on his 86 350x. he purchased it from a man that worked at a honda dealer in southern Illinois. accordind to him, they recieved a shipment of 350x's before the decree, but were never allowed to sell them. before they arrived, they were ordered to dismantle the trikes and cut the frames into pieces and ship them back to the factory or loose their honda franchise if they sold them. he had all 12 of the motors in crates in his garage. if you run the numbers on the motor, they dont show up in the parts catalogs, but it is a 350x motor. i'll assume the 250r's met the same fate. this gentleman still works at the dealership, and has been a mechanic there for 25 years. hope this helps. Since writing the above I have gotten the tape and watched it. It was taken at night and it is very difficult to see the bike clearly, but there are 4-5 times It is in a decent view and from what I can tell, it does indeed have the color scheme of the 87 250R. However its not closeup enough to be sure. I do not have the capabilites to transfer this video to an .mpg format video to put on the site for download, but I'm working towards getting setup for it soon. I will be sure to post the best showing clips when I have the capabilities. 1. White Tank shrouds VS The 86's Red ones. 2. New gas tank Honda Logo, Blue/white combo. 3. Red rear mud flap VS the 86's Black one. 4. Fork Boots appear to be Black VS the 86's Blue ones, BUT I have personally checked this new brochure by changing the Brightness/Contrast and have found that THEY ARE BLUE like the earlier ones. 3. New Graphics on the rear fenders that say "R". 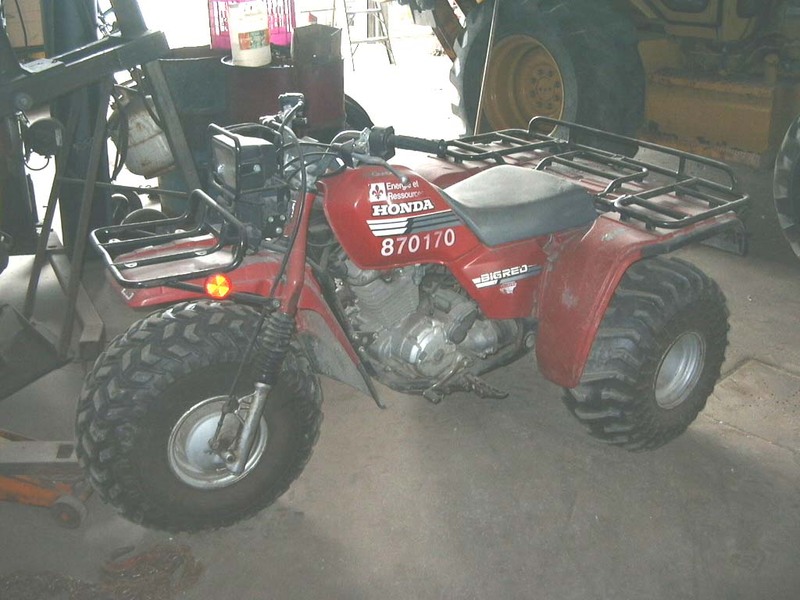 This design is similar to that of the 86-87 Honda TRX250R Quad. The keyed ignition possiblitys are almost positive. 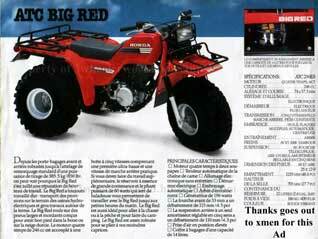 The 86 ATC200X did not have keyed ignition, the 87 did, the 86 TRX250R didn't have keyed ignition, the 87 TRX250R did, ect ect. However, its still not a certain fact. And it probably never will be unless someone happens to find or see one up close in person. The new English brochure has a very good view of the area where a switch would be, and it does look to have the small "Dashboard" area. However the bikes are at the wrong angle in the brochure to be certain. There have been a few leads on to 87 350X's or 250R's, all leading into dead ends though. Most notably, there was an 87 350X on eBay recently that was actually an 86, but since it was manufactured after the 6th month of 1986, the seller considered it an 87. I'm not really sure that's a fair way to market the machine, but its not my place to decide on that. It however, was another lead that went to a dead end. The leads on 87 250R's are very, very few, and far apart. Infact the only substantial one I've ever seen is the picture of the seat above. Its certainly not something written in stone by "God Honda" that they are out there, but I believe its a pretty good indication. 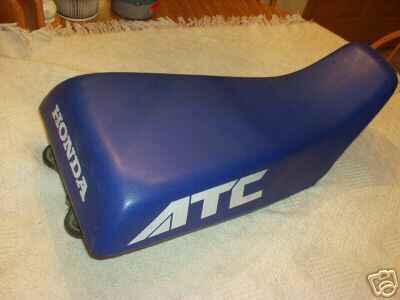 More discussion on the topic of the 87 ATC250R seat can be found at This Link that link also has some pretty interesting photos of 250R frames that appear to have been cut up from the factory. Alot of parts remain on those two peices. More research in the process about this, but for now I would suggest you make your own call on what you see. It is my firm belief that the '87 ATC 350X and 250R ARE out there, but in very, very small numbers. Mostly in Canada, and Europe. I seem to recall a rider who lived in South Dakota, who wanted a '87 R, so he drove up to Canada, bought one, and brought it back to ride. There was a published story that came out in the paper, that manufacturers like Honda, did in fact, ship 3-wheelers to Europe to find a home for unsellable units. That shook up a lot of people at the time, saying they were selling "dangerous" ATCs to unknowning buyers in foreign countries. EXTRA EXTRA! Possible 87 250R seat found! Clearly, they are different. This brings us to more speculation, such as where did the seat come from, Was it infact off of a complete 87 R trike at sometime or another? Was it taken off an 87 and used as parts and put in a warehouse, or is it by some weird coincidince an aftermarket seat cover? Here is a rough translation from xmen. Please keep in mind that there are some French expressions that just can't really be totally translated correctly. The 87's are highly sought after, and the "Quest For the 87 ATCs" continues on.